We were all starving. Quick dinner time. I tossed a pot of rice on the stove, and pulled out what I needed for stir fried sesame chicken with shitake mushrooms and celery. I wanted a salad that would work with the stir fry, and a jar of hoisin sauce sitting in the door of the fridge caught my eye. I grabbed mint, daikon, scallions, mushrooms, and my hand picked mixed greens, which included a hefty amount of mizuna. 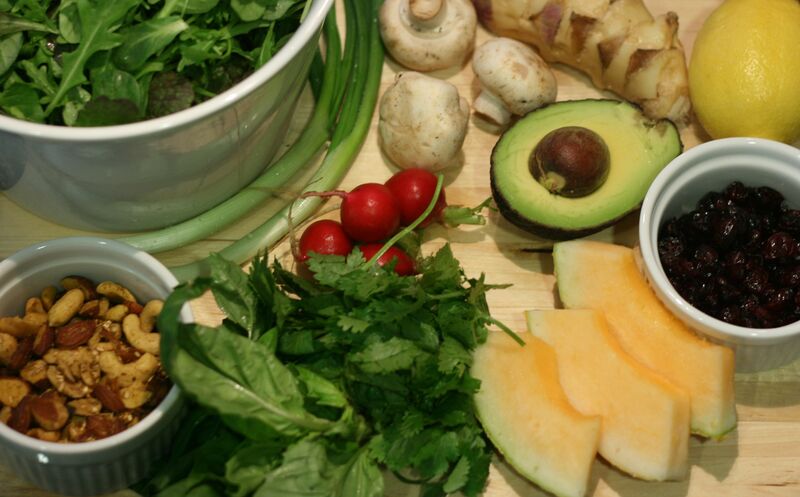 The ingredients, ready to be transformed. 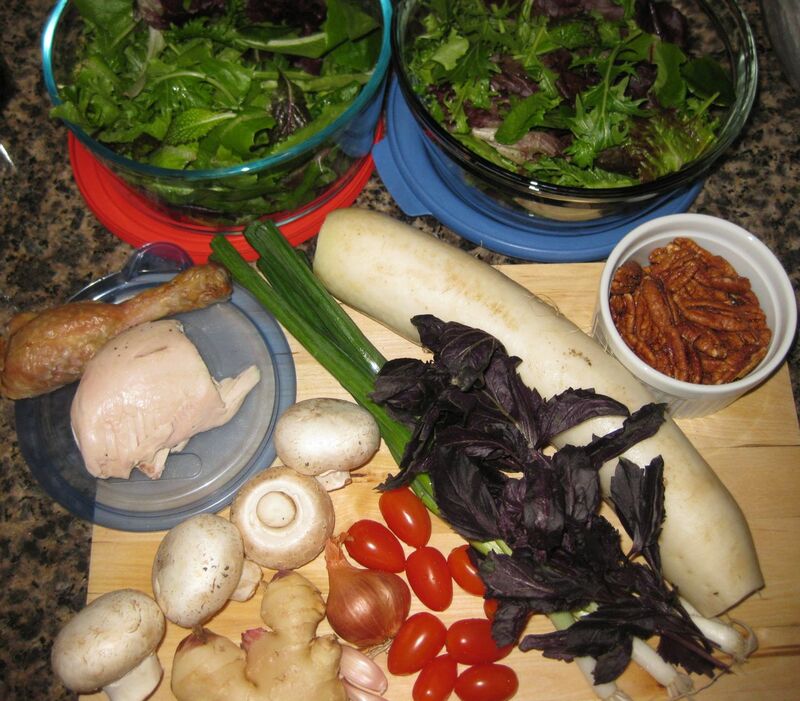 6 cups of mixed greens, including mizuna, red leaf lettuce, radicchio, and frisee. 4 inch piece of daikon, sliced. 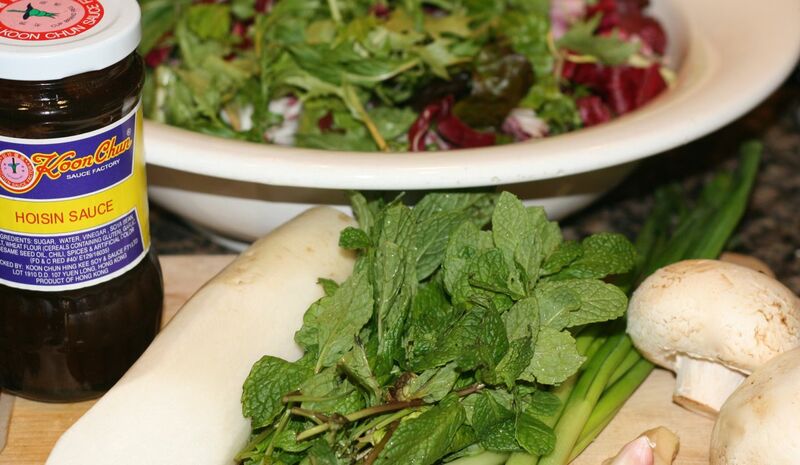 1 generous fistful of fresh mint, chopped. Up close look at all the beautiful colors. 2 inch knob of young ginger, chopped. 1 clove of garlic, smashed and minced. I mixed up the vinaigrette right away, tasting it as I went to make sure the flavors were working together. Then I prepared a bed of greens. I chopped all the vegetables and added them to the bowl. 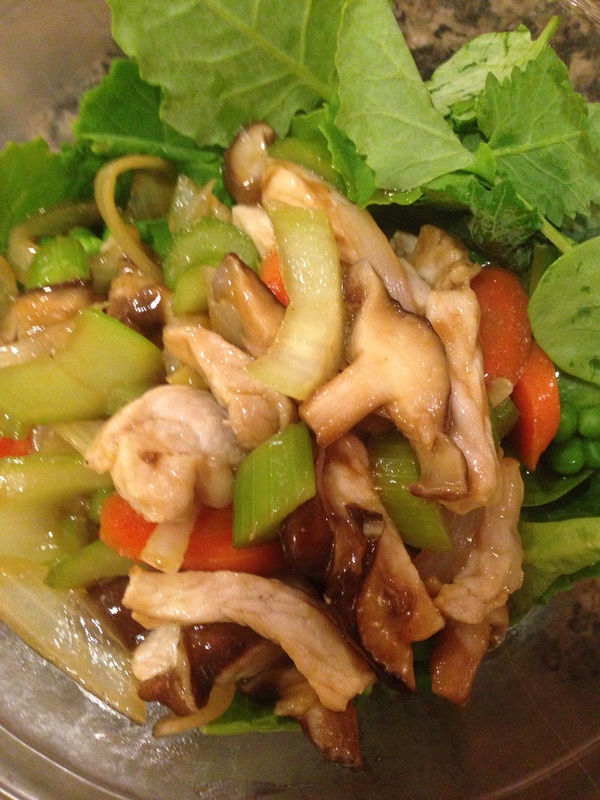 When the rice and stir fry were done cooking, my salad was ready to be dressed and tossed. On the plate and ready to eat! This was incredible. It helps that I absolutely adore hoisin sauce with mint. The daikon added perfect crunch and that yummy peppery flavor, and the mushrooms soaked up the vinaigrette like the tasty little sponges that they are. It was a little too weird for the kids, but my husband and I ate every bit of it. Absolutely perfect. Add your protein of choice — I highly recommend leftover steak, sliced over the top of the salad. 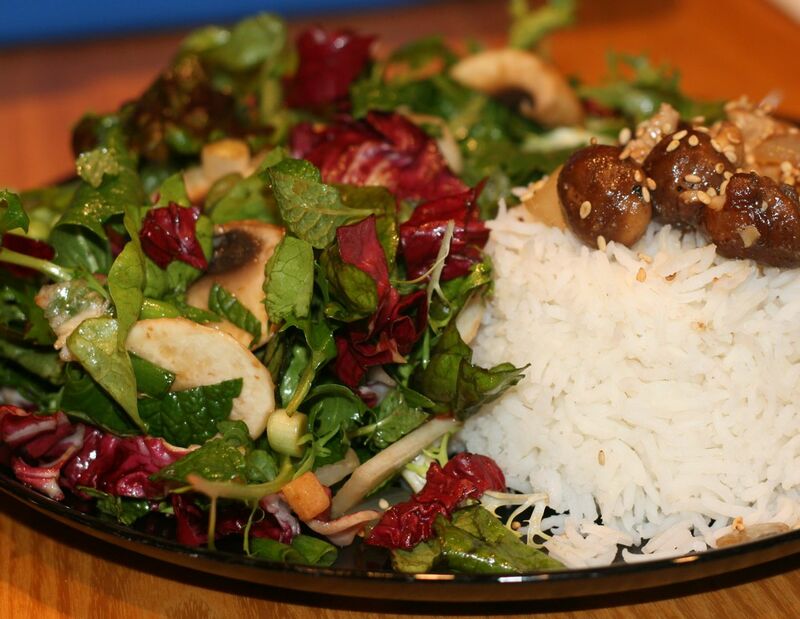 Beef and hoisin and mint together are mouth wateringly delicious. Simple chicken or grilled shrimp will also work well. For vegetarian options, I think tofu would be a great addition, or shelled edamame, or green beans, or snow peas. This one is easy. 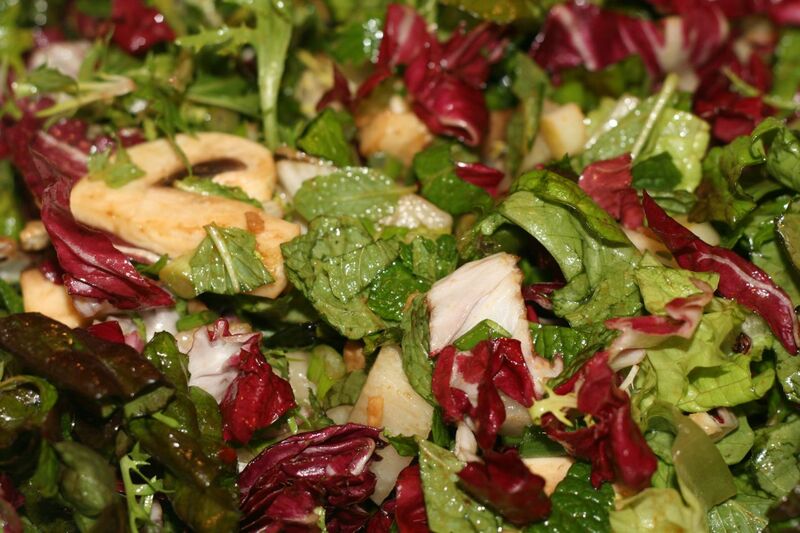 Salad in a large glass or stainless steel container with a tupperware-style lid, vinaigrette in a small jar. 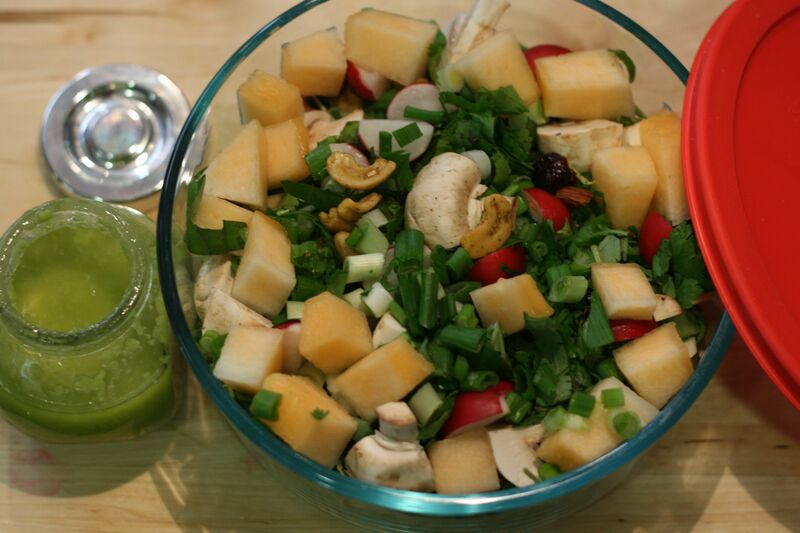 Shake vinaigrette, drizzle only as much as you need on the salad, and then fork toss or put the lid back on the large container and give it a few good shakes to combine. Eat and enjoy. Sometimes I want my salad simple, clean, maybe even elegant. Sometimes I want a hearty, filling salad. And sometimes? Sometimes, I just want a rioting mosh pit of flavors and textures. 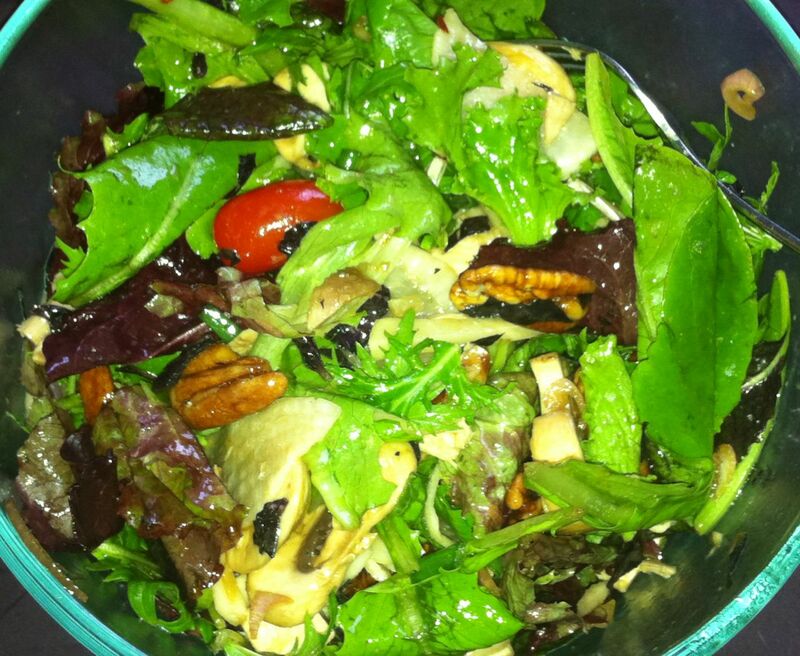 I was definitely in the mood for some crazy flavors to explode against each other in my mouth when I made this salad. I was inspired by a bag of lime & chile mixed nuts from Trader Joe’s, and I wanted to play with that amazing hami melon again, and I had a perfectly ripe avocado sitting on the counter… I just kept adding vegetables and ginger and herbs and garlic and more and more to the cutting board, until I was satisfied. And then I got to work. Bold, colorful, and soon to be delicious. 3-4 cups of arugula and asian greens. 2 T lime & chile mixed nuts (from Trader Joe’s). 1/2 cup hami melon, cut into bite sized pieces. 1/2 avocado, spooned into the jar. 2 tsp fresh grated ginger. 1 small clove of garlic, smashed and minced. I was making two salads, so I doubled all of the ingredients listed above. 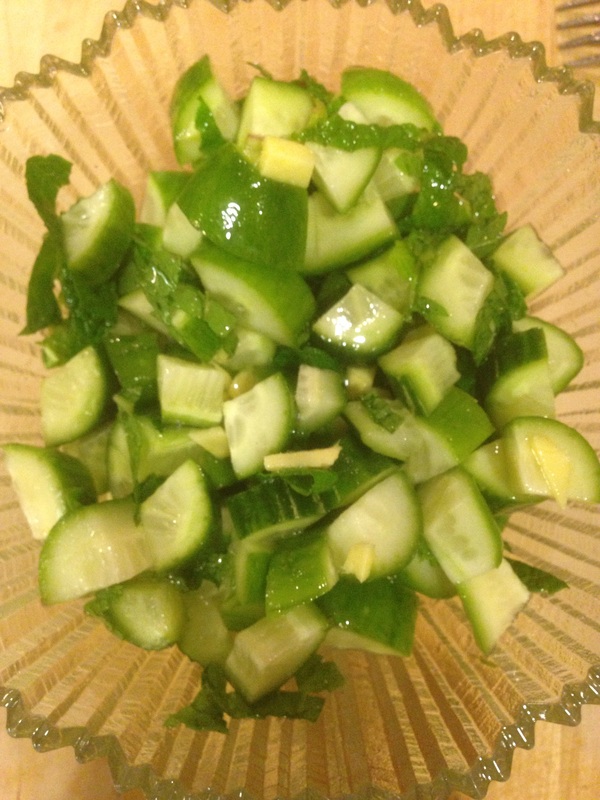 I started by creating my beds of greens, and I zested a lemon over each container of greens. Then I juiced the lemon and made two batches of the citronette. 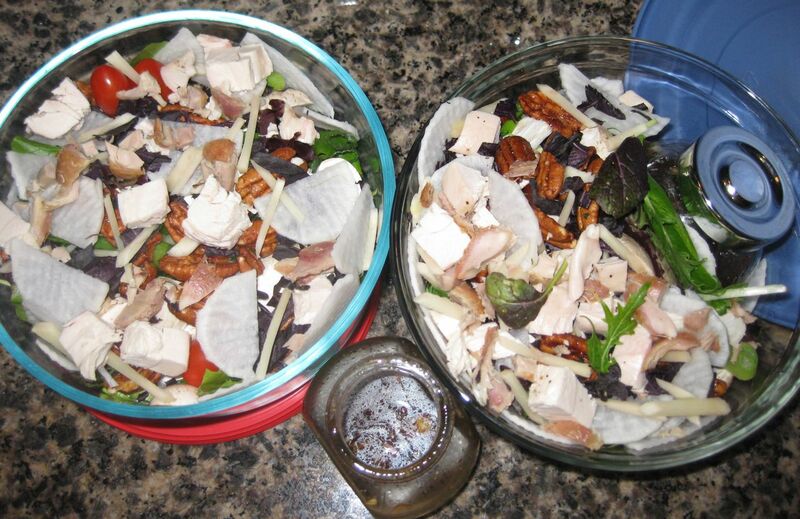 I chopped and sliced and chopped some more, divvying the fruit, veggies, and herbs up between the two salads. Finally, I packed both up and looked forward to the wild party my mouth would have at lunch time. This worked. Completely intense, and incredibly tasty. I loved the spicy nuts with the creamy avocado citronette. And I loved the crunchy radishes with the crisp melon. 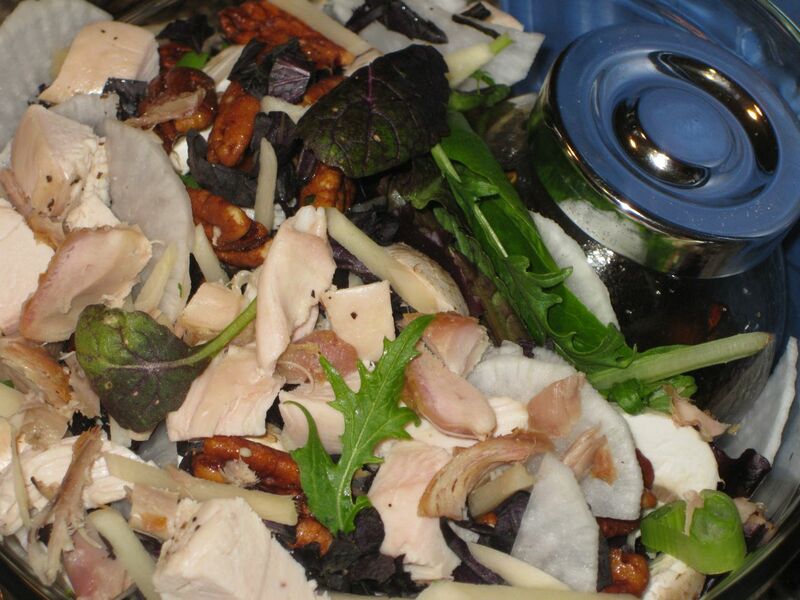 The mushrooms did what they always do — soaked up the dressing and exploded. It was good. Crazy good. My anticipation and excitement were so great, I completely forgot to take a picture of it before devouring it. You’ll just have to imagine it in all it’s glossily dressed splendor. Done. 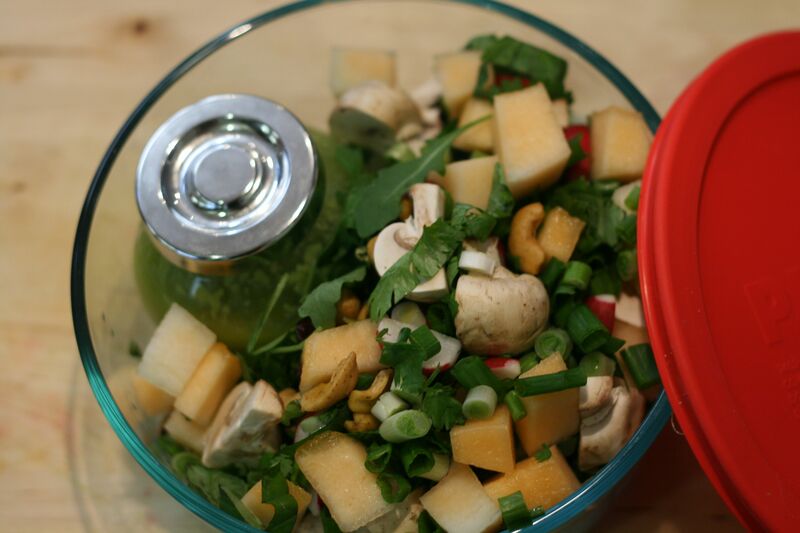 As usual, pack your dressing in a small jar (large enough to hold the avocado) and make your salad in a large glass or stainless steel container with a good rubber lid. Add the citronette right before eating, fork-toss or put the lid back on your salad container and give it a few good shakes to help combine everything.